Chairman Kelvin Thomas says the Cobblers’ financial partners 5USport are ‘obviously concerned’ by the team’s current slump in form - but they are fully behind boss Jimmy Floyd Hasselbaink and the players. 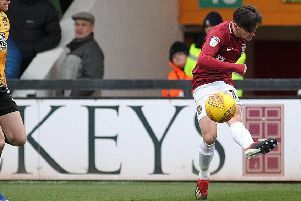 The Chinese company bought a 60 per cent share of the club’s holding company Northampton Town Ventures Limited in the summer, and helped to provide the finance that allowed Justin Edinburgh to put together the current first team squad. Hopes were high that the team would enjoy a successful season, but as yet it hasn’t materialised, with Edinburgh being sacked after four straight Sky Bet League One defeats to start the season. Hasselbaink was hired to turn things around, but with the season almost at the halfway point the Cobblers are second bottom in the table, and are on a run of six matches without a win, with five of them ending in defeat. Town were thumped 5-1 at fellow strugglers Oldham Athletic last weekend, a result that has set the alarm bells ringing among some of the club’s supporters. It’s not something 5USport would have been hoping for either, but Thomas insists he and the Chinese backers, including chief executive Tom Auyeung, are keeping their cool. Thomas has already said it is now down to everybody at the club to stick together to try and turn their fortunes around and fix things, and he says 5USport are part of that. “They are obviously concerned, like all of us,” said Thomas, when asked what 5USport’s reaction has been to recent results. “But when I say we need to stick together, 5USport are not excluded from that, and they are very much behind everything and wanting us to do well. “People will have seen them at games, and the excitement of games and disappointment is shared. “Nobody is coming away from what happened on Saturday and saying ‘that was alright’, everybody is very disappointed. “I know Tom watches the games in China, and I am sure he was there late at night in Guangzhou and was bitterly disappointed. “But they have a good understanding of what football is, and what it is about, how it is a long season and working towards that.